Hey guys I know its not the place to ask or say this but my gf of 2 years just lost her older brother two days ago in a car accident. He was in the Navy and was coming home to visit along with he's wife and new born son. I'm just asking to keep her and her family in your thoughts. Maybe I can show her the nice replies and show her people/strangers from around the world will still care for others in need. @7jsoto, We're always here for ya brotha! @7jsoto, So sorry for your loss, I understand your pain. It's extremely difficult after losing someone you care about. I assume that the rest of the community feels the same way I do. We are like one, large, happy family who will help comfort you in this sad time. Best of wishes. @7jsoto, I'll be praying for her and her family. When things like this happen, you can't just "get over it" like some people seem to think. It's harder than anyone can imagine if they haven't experienced it first hand. While I can't offer any real advice, I can tell you that support from family and friends is the best thing you can ask for in times like this, so don't be afraid to lean on your loved ones. @7jsoto, That's going to be a hard road for his wife. I hope she finds peace in all of this. @7jsoto, my deepest condolences to you your girlfriend and her family. May they find the strength to carry forward after taking all the time they need to mourn. @7jsoto, I'll definitely keep her family in my prayers. So sorry that happened, stay strong. @origamiguyljb, y u gotta be "that guy"
@Turian, I say hey. What's goin on! And I say: PIIIIIIIIKAAAAAAA PIKA PIIIIIIIIKAAAA! This creature, I like it *smashes it on the ground* AAnither!!!!! 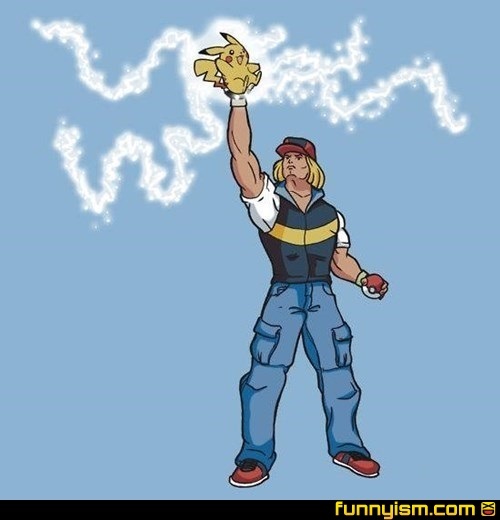 By the power of electric stone!